A few days ago, I arrived home to a clock flashing 12:00, a dead modem, damaged router, and no sound from my computer. After replacing all the dead components, I turned to my router. The WAN port was the only part damaged in the strike. So, I felt I could save my router. During a previous failure I flashed my router with the DD-WRT firmware, thus making it, in my opinion, fully configurable. A few hours of searching yielded an architecture diagram. (Note: I have a Linksys WRT54GL v1.1. Other Linksys routers might have a different structure.) 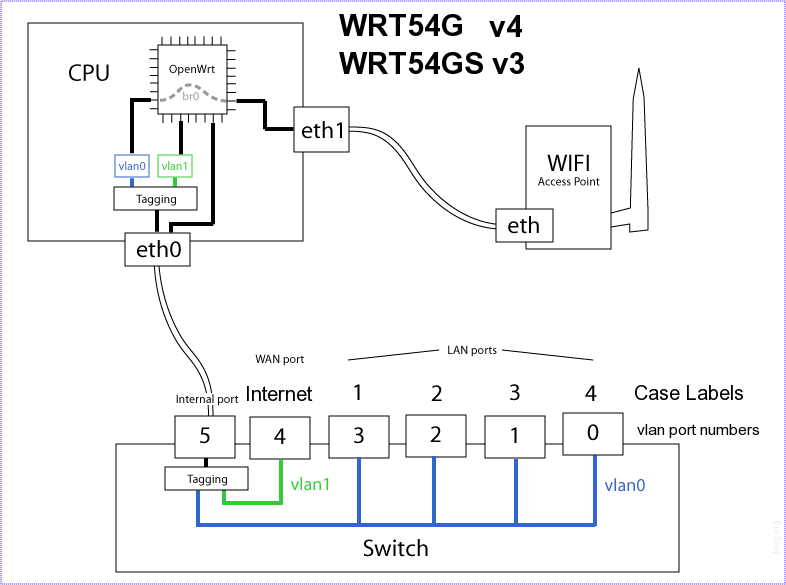 I combined it with the instructions on http://www.dd-wrt.com/wiki/index.php/WAN_Port and http://www.dd-wrt.com/wiki/index.php/VLAN_Bridging_WAN_and_a_LAN_port, and moved one of the LAN ports to VLAN1. One router saved by Linux. Go Linux.